Nandavanam Center of Excellence for Children with Developmental Challenges organized an Art Duet at the Cholamandal Artists Village. 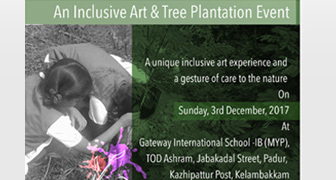 Injambakkam, to commemorate the world Disability day on the 3rd of December. It was an opportunity created for 40 persons with special needs and 46 volunteers to experience the therapeutic effect of Expressive Art firsthand. The participants and volunteers team got to connect and forge a bond with each other and thus experience the warmth of friendship. Materials provided for the programme were organic including natural pigments and bamboo brushes. The aromatic materials made the programme unique and therapeutic. The special participants were from Swabiman Trust, V –Excel Education Trust, Vidyanjali, Asha Nikethan, SCAN network and Nandavanam. The volunteers were from Newgen KnowledgeWorks Pvt.Ltd. and SIET college. ‘I enjoyed foam rub painting and loved working with my volunteer partner’ says Peter D’crus, 75 years from Asha Nikethan, the oldest participant. The participants enjoyed the four art work stations, Mono Printing, Zen Painting, Play with Clay, and Thrills and Spills. The parents and accompanying persons were kept busy with ‘gift wrap papper work. 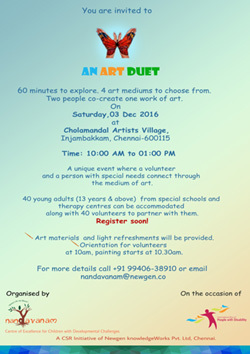 Renowned artists from the Cholamandal Artists Village, Jacob Jabaraj, Ranjini Jacob, Augustine Thilak, Latha Gopal, Mala Chinnappa and Jyothsna Srinivasan were the facilitators.